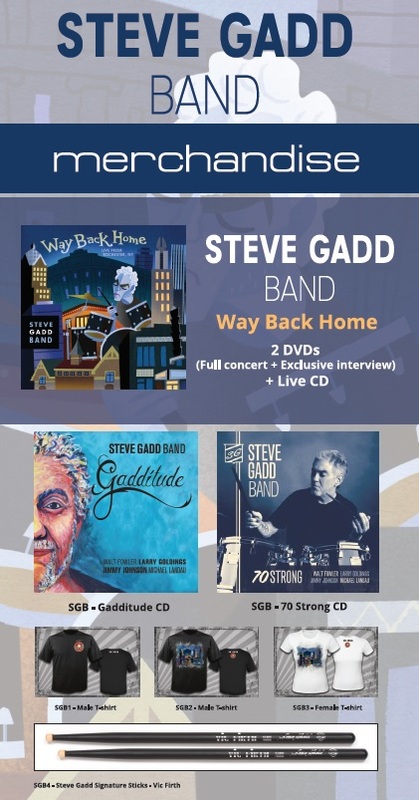 We are entering the last month of preparations for the Steve Gadd Band Way Back Home Tour this Autumn. The TourBook is almost complete, Backstage passes are sent to print, we are wrapping up the merch.. We’re sure that the SGB fans are very curious to see the merch which will be available on this year’s Tour… Global Artist Services are offering you a sneak peak! The merchandise will be available for purchase during each show of the Tour and the Band will be signing shortly after the end of each concert. This year’s merch will be a mix of some previous albums and quite a lot of new things. In addition to the 70 Strong CD, which we were already selling on last year’s tour, fans will be happy to hear that we will be selling another previously released SGB album: Gadditute. Regarding the new merchandise, we will be offering 2 new types of male T-shirts and, as a special novelty, one new type of T-shirts for the ladies. A special treat for all the fans will be the Way Back Home Box Set containing two DVDs and one Live CD. 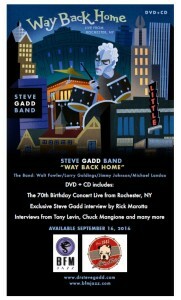 The Box Set includes a DVD of the full concert from Rochester, NY and one of Steve’s exclusive interviews. The Live CD contains 8 of the tracks played on the concert in Rochester. Last, but not least, Steve Gadd’s Vic Firth signature sticks will also be for sale on our merch booth. We’re sure the fans will be thrilled to get a chance to see the Steve Gadd Band perform live and also to leave the venue owning an item signed by Steve Gadd and the rest of the Band. Take another look on all the dates for the Steve Gadd Band’s September/ October 2016 Euro Tour and find a venue nearest to your home. See you at the gigs! ← Welcoming a new member to our team!